I began this journey at Quito Airport, Ecuador. I, along with a few others making the same trip, caught a flight to Coca. The flight itself was only 30 minutes long and a we landed, the heavens opened. My goodness, it rained! We were met at the little airport and after a quick swim across the car park, we hopped on a bus to the port, and then transferred to a motorised canoe. 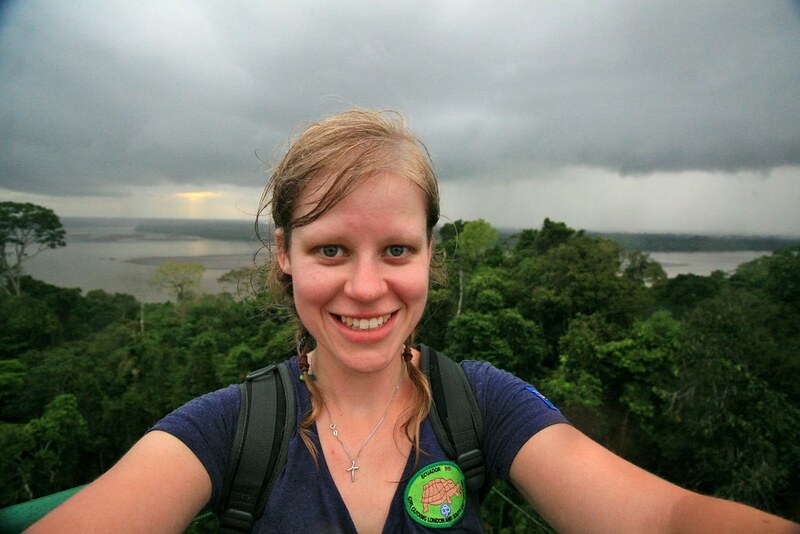 We zoomed down the Napo river, an incredibly wide tributary of the Amazon, and spray leapt up around us. After two and half hours, we alighted at a tiny, isolated jetty, walked over the bank to a much smaller river, and climbed into a 10-man paddle canoe. It was another half hour's paddle to the lodge and it was incredibly atmospheric. No one spoke; in some ways the forest seemed very quiet with the absence of human sounds, but in other ways its a real cacophony as birds, insects, frogs and monkeys compete to make the most noise. The trees crowded in, concealing their secrets and were still. It was steamy and humid. The lodge turned out to be gorgeous: open and thatched, lots of windows screened only by mesh to keep the bugs at bay but let in the air, 4-poster beds hung all around with lacy mosquito nets in lacy swathes, and a magnificent rainfall shower. For the first time in the 3 weeks since I'd left home, I was actually clean! I was grouped with some other guests to make a party of 8, and we had meals together, went out on excursions together, and I really enjoyed the company. We set out for an early evening paddle to explore the lake and our guide was brilliant; very knowledgeable and informative. 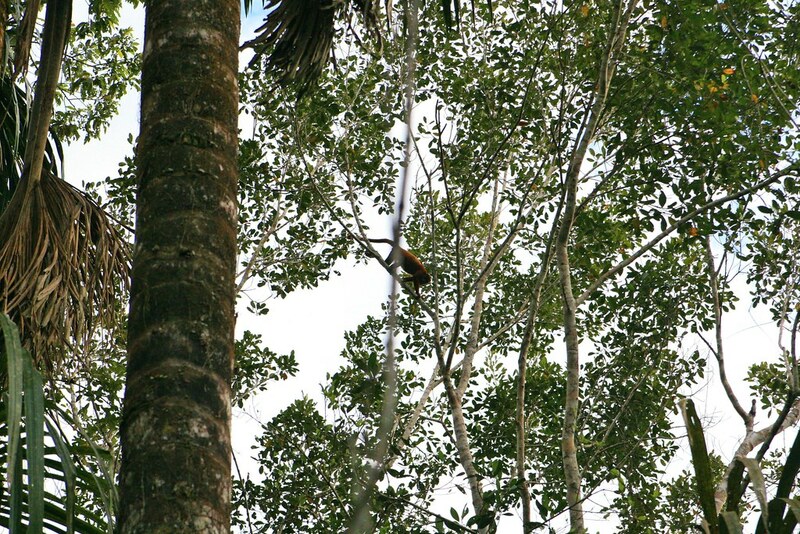 We saw tiny, roosting bats, stinky turkeys (that's actually what they're called), herons and even a little pygmy marmoset, the smallest species of monkey! The sun set as we returned to the lodge for dinner, and as we ate on the completely open first floor terrace, we were entertained by the wildlife in the surrounding trees, hunting for fruit and berries. Just magical! 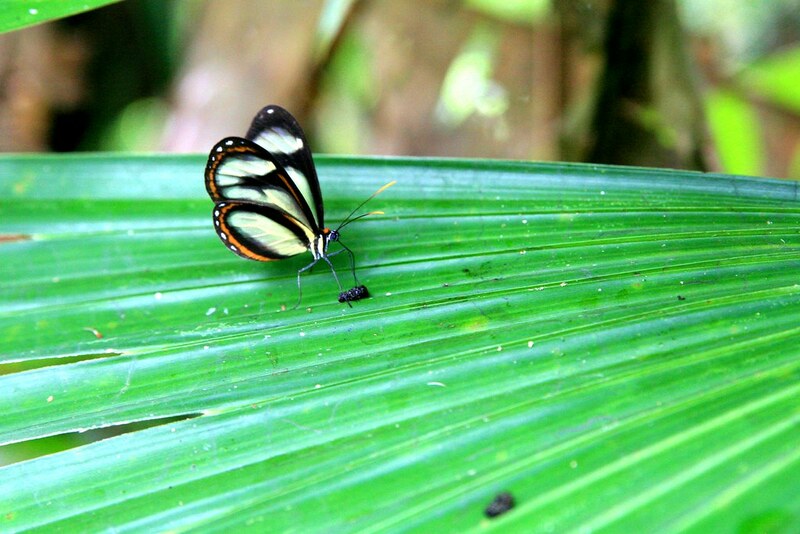 We were up at six in the morning; it's early starts in the rainforest to make the most of the day. 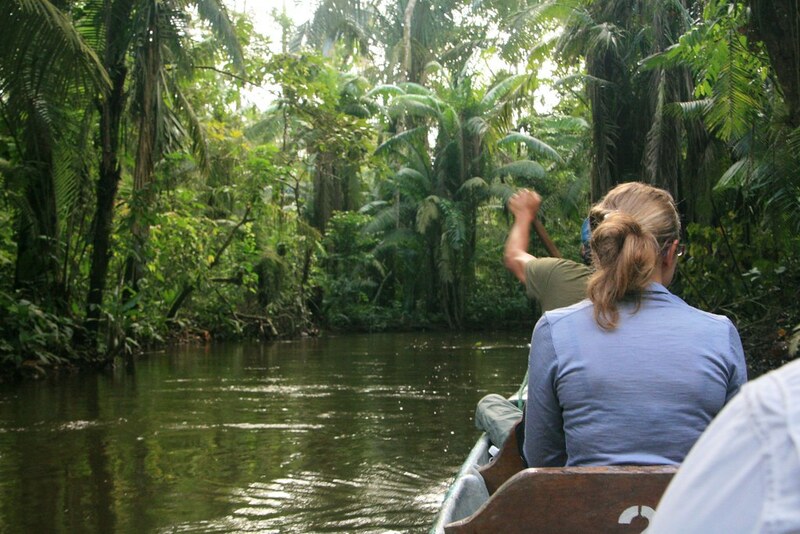 We breakfasted, and then took the canoe back to the Napo river. We went upriver to see the parrot clay lick: a place on the bank where hundreds of birds gather to lick up the nutrient-rich clay, and to socialise. Dozens of bright green parakeets squabbled with one another, flashing blue tails and wing tips and squawking madly. 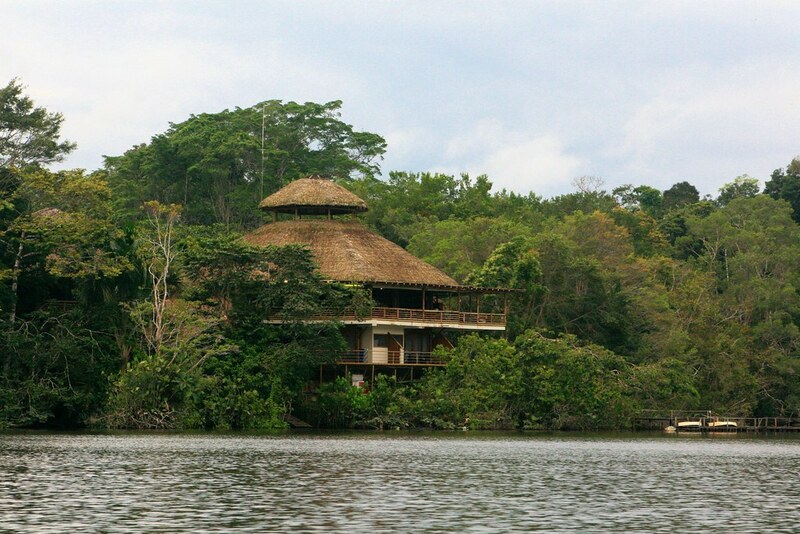 We went downriver next to visit an indigenous community of the Amazon basin. We were met at the riverbank by a number of women who are effectively managing the community to raise an income from tourism. The men mostly work away from home for long periods, and the women are expected to produce crops, bring up the children and generally keep things running. Tourism allows them some independence as the women can bring in their own money. A young woman with a tiny baby in a sling, and a machete gave us a tour. 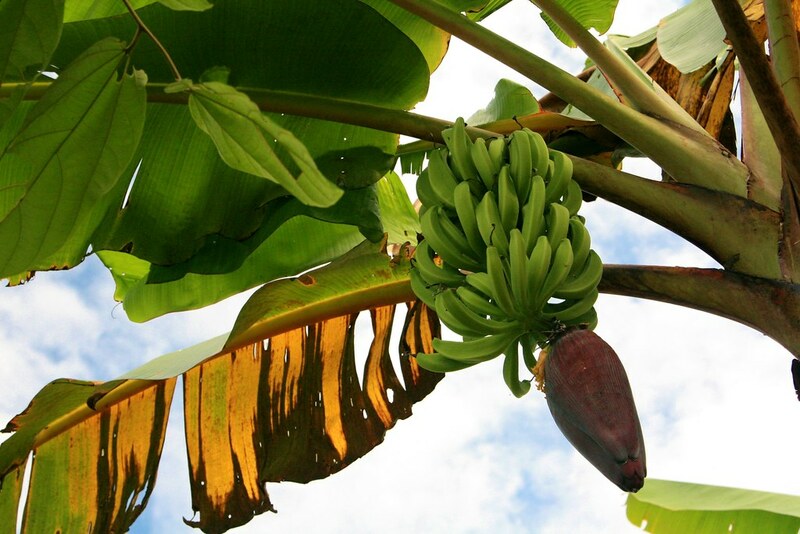 She hacked her way forwards, clearing a path, and harvesting fruit and sugar cane for us to try. Yum! We visited the crops and were able to see the school (which was closed for the summer) and then we shared a meal. We ate possibly the most delicious fish I've ever had. 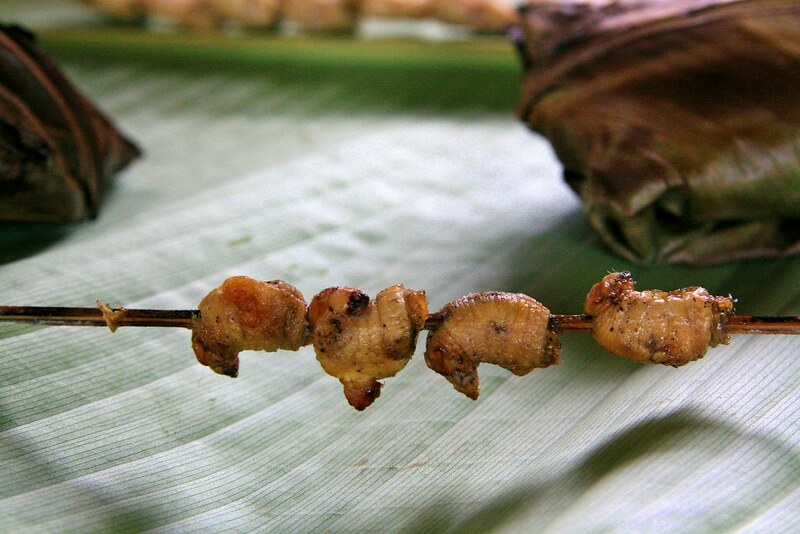 It was a type of catfish, found only in this area, topped with heart if palm and roasted in a fire, wrapped in palm leaves. It was so tasty and tender, with a hot chilli sauce that made it sing! We also sampled white cocoa beans which were fire-roasted and delicious and tasted like walnuts, and finally the tried the local delicacy of weevely grub lavae things. They tasted sort of like bacon but were squishy and distressingly creamy on the inside. We ate our full allocation between us which pleasantly surprised our guide. He said most groups won't eat them, so he ends up having to consume the lot to avoid causing offence. We washed all this down with plantain and a strange porridgey drink made of fermented sugar cane. 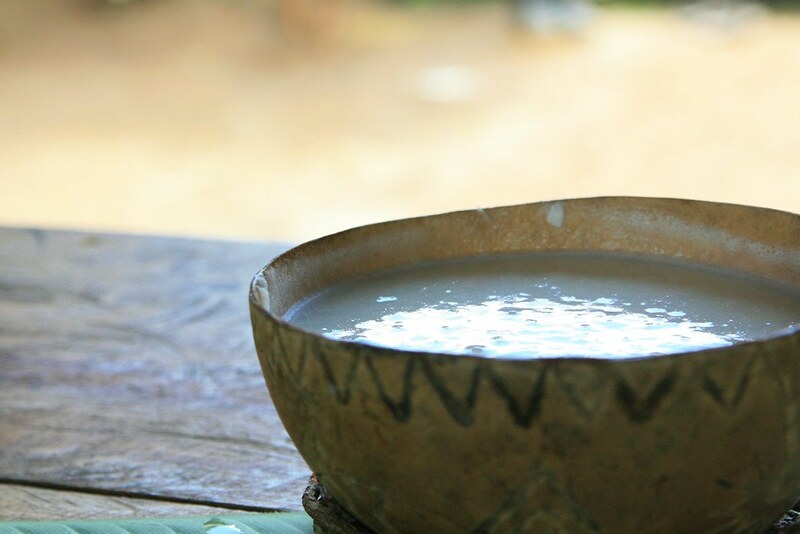 It was sort of yeasty, with a beer-like quality, and the fermentation is traditionally done by elders of the community chewing on the sugar cane and then spitting it into a communal pot. Apparently this isn't usually done any more, but even so, I wouldn't say this was my favourite beverage to kick back with. The canoe paddle back to the lodge was fantastic; we saw huge spiders and little turtles and the intensity of the rainforest crowded in. I love it here; it genuinely feels like being lost somewhere and forgotten in another world. But one where you can then go back to the lodge and have a hot shower. 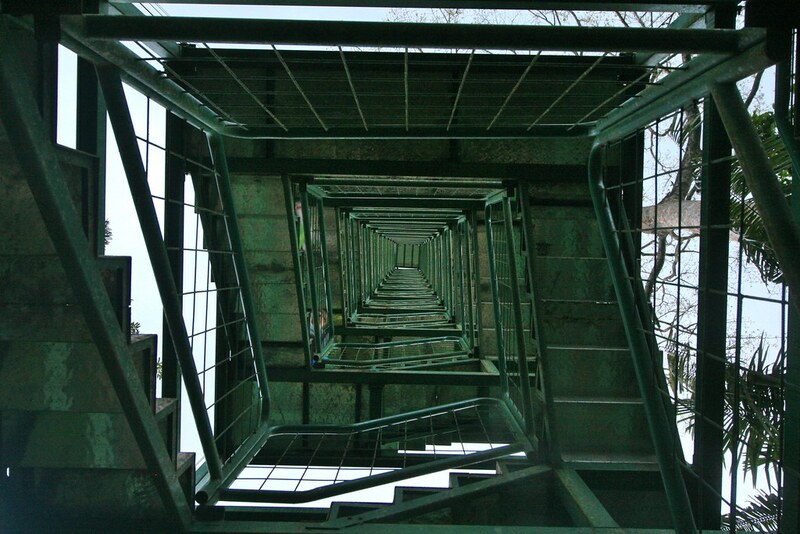 In the afternoon, we walked through dense jungle to the observation tower. The rain had begun again in earnest, and we shrugged into fantastic, voluminous waterproof ponchos. They were terrific! We donned our wellies and enjoyed the scramble. We were advised not to step on any boulders or rocks that look red, as they become extremely slick and slippy in the rain. Of course genius here couldn't resist trying it out. They are very slippy. The guides were right. You shouldn't step on them. We reached the observation tower and a couple of us raced to the top. I came a very respectable second, and claimed that I wasn't even competing anyway. And my goodness the views were worth it! There was a quick break in the rain and so I shrugged off my sodden poncho and hauled out my camera to capture some of the landscape. 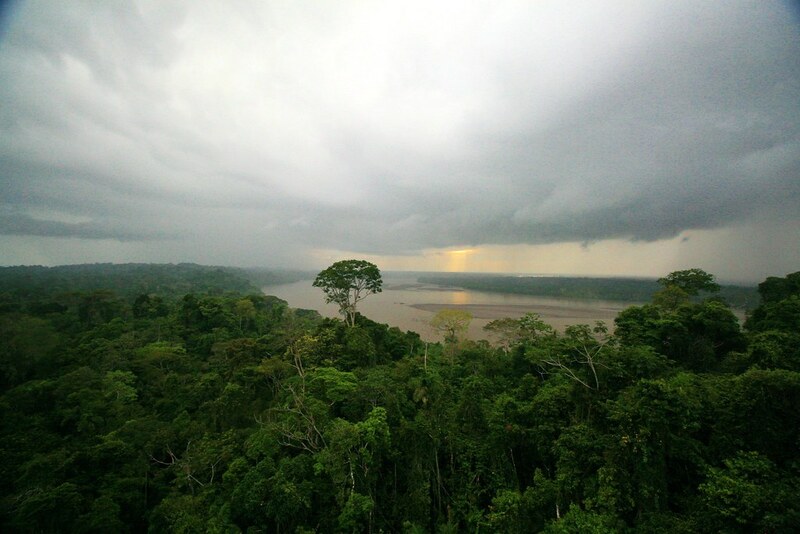 The forest reaches forever in every direction, interrupted only by the wide, meandering path of the Napo. Early Spanish explorers of the area assumed that as the river was so wide, they must be near the East coast of South America as it must surely flow into the sea soon. But of course, they weren't. The Napo is just one tributary that eventually becomes part of the Amazon, but not knowing that, many groups of infantry were decimated by disease and died in their fruitless attempts to explore and reach the Spanish army arriving in Brazil. The rainforest is an incredible place, and to be up above the canopy, on a tower swaying a little in the wind, was spectacular. It was getting dark when we glided in our canoes back to the lake. We climbed out of the boats some distance from the lodge to go on a night hike. The rain was back doing its thing but I was happily huddled inside my poncho. It was very dark and scrambled along in a line, calling warnings over our shoulders about stray roots and low branches, trying to be heard over the clattering rain. Glimmers of torchlight and deepening puddles pooled around our mud-splattered wellies. We saw a click beetle, its neon-orange headlamps glowing ethereally as it flew. How the guides spot anything in the dark is beyond me. But somehow they glimpsed the front two legs of a tarantula, crouched in its hole and ready to strike. The guide gently tapped a stick just outside the tarantula's lair and it pounced, emerging from its den, before scuttling back inside empty handed. It was an amazing moment. 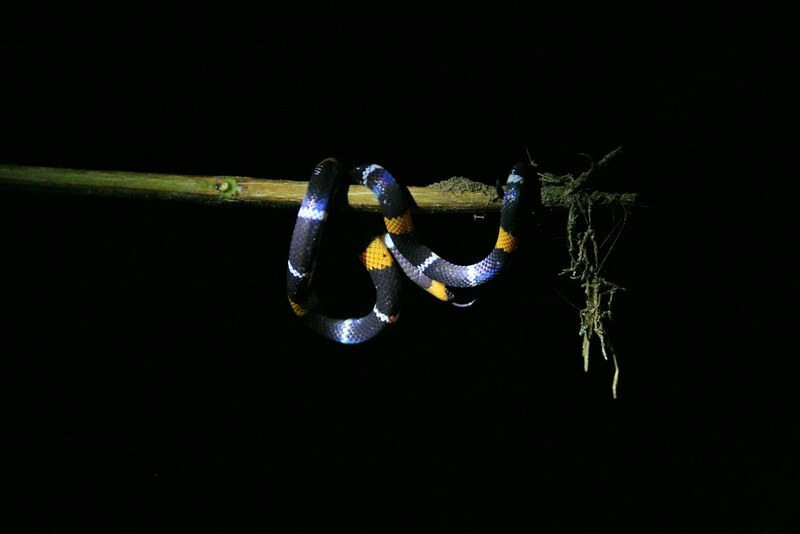 Back at the lodge, torchlight picked out a young coral snake, coiled in ribbons around his perch. That was the first snake we found and I'd never seen one in the wild before. 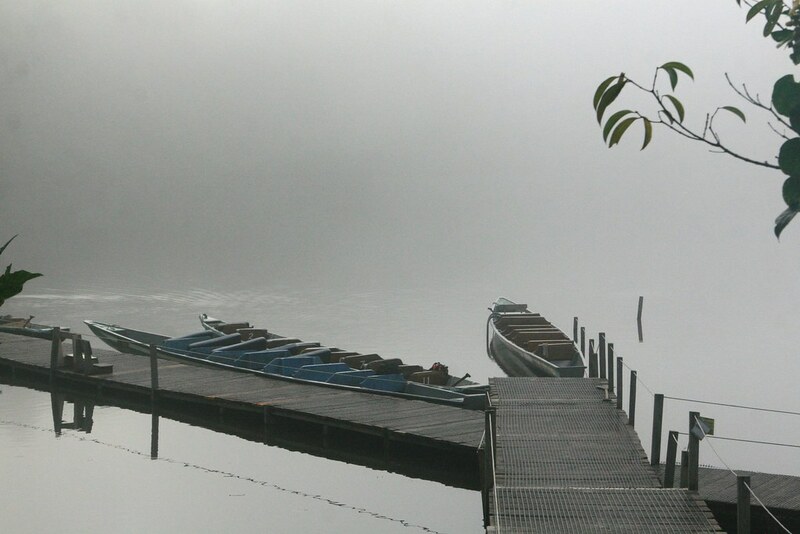 From this jetty, you can catch a canoe, swim, or fish for piranha. Your pick! Another 6:00am start and a misty dawn greeted us. The rain from the previous day was still falling with gusto, and so it was clearly a good day for a hike! Our group was reduced to three, with a family departing that day, and as we were all reasonably young and fit, the guide offered us the chance to hike a more challenging route. We accepted! We wandered who lived in these tiny little cocoons. Buterfly! But our guide wasn't really into them. Despite the rain, our guide found us plenty to look at. 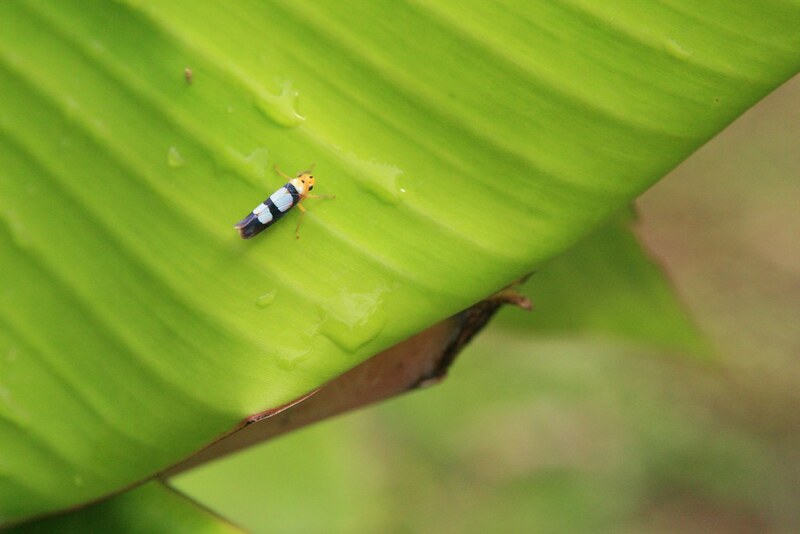 We saw gold mantle tamarind monkeys, tree frogs and rain frogs. We saw an almost perfectly camouflaged cricket too. As in it was so well in tune with its surroundings that even when it was inches from our guide's pointing finger, I initially couldn't see it. We were also shown a patch of moss that suddenly wriggled and turned out not be moss at all, but lots of green, furry caterpillars. We absolutely loved our off-the-track excursion; it was a real experience. I don't really have pictures though as the rain was so heavy and the air so humid that the lens would be simultaneously drenched and steamed up, so I couldn't get much focus. Or see much. So I abandoned the camera and stored up everything I could in my memory for my travel journal. In the afternoon I went piranha fishing in the lake (with a Canadian Girl Guide I met - cool!). More accurately, I went piranha feeding as the fish were being naughty: eating the raw meat bait off the end of my line, but not having the courtesy to hang on. I could feel them tugging and pulling but they were too quick and bitey to be reeled in. The manager of the lodge took pity on us and said she knew a secret. She fetched us a few bread rolls from the kitchen and said that the piranhas cannot resist fresh bread. She was right: they ate all that too. Cheeky beggars. Our final excursion was canoe bound, and once again our merry band of three was paddled off the beaten track by our trusty guide. 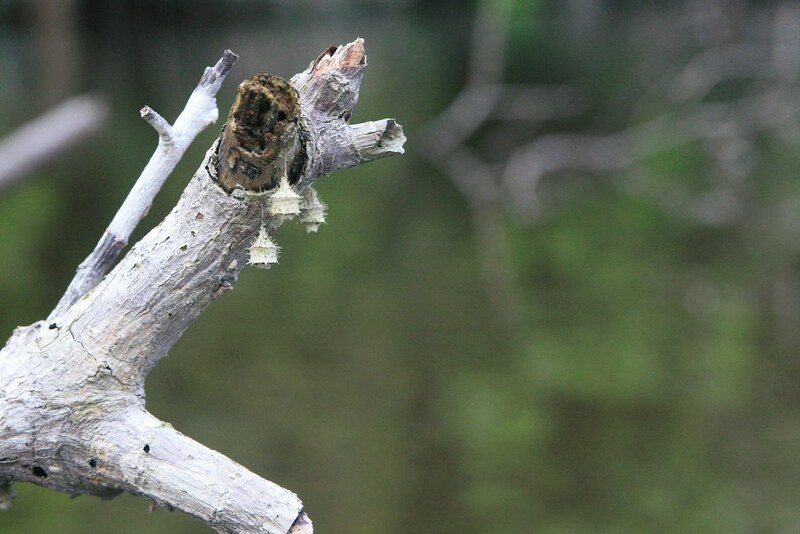 He found a tributary that hadn't been used all year for us to investigate, as we were keen to see if we could spot caiman or anaconda, as both live around the lake. As the boat glided into mangrove swamp land, the guide balanced on the front of the boat, waving the paddle in arches through the air. We eventually asked what he was doing. And it turns out he was clearing out the spiders webs. Either they break on the paddle, or they break in our faces. Please, carry on. 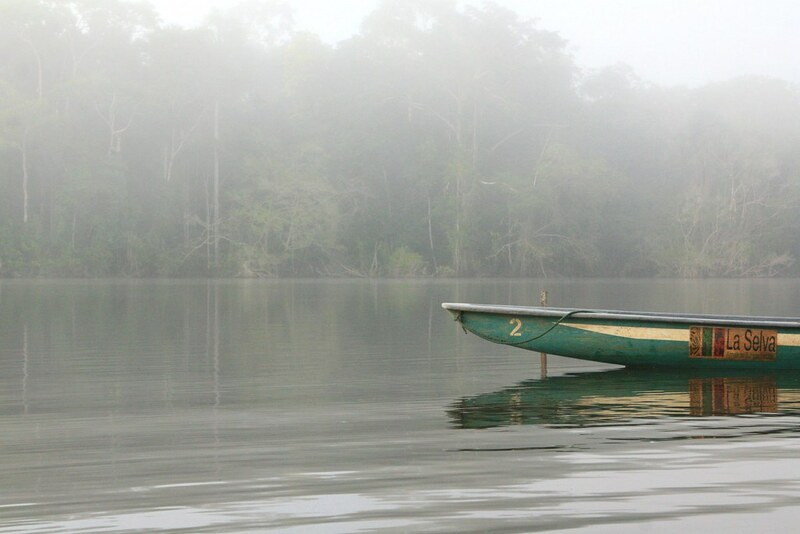 We weren't successful in our hunt, eventually accidently grounding the canoe and then struggling to turn it round and back out, but it was a lovely way to while away our last few hours of rainforest wonder. Even the rain stopped.